While any confident person could walk up to a keynote speaker and have a conversation with them onsite (many people tell us they usually cannot do this), we feel virtually connecting can expand that conversation so others can join virtually, watching live or later. Our ‘onsite buddy’ makes new connections with people onsite as they set up these meetings, and often continue the conversation after the live session. When others from all over the world join virtually, they extend the conversation beyond the limits of those physically present. A one-hour keynote (usually delivered mostly one-way) becomes a continuing conversation others can watch later. This year at #altc we got to know Steve Wheeler (Associate Professor of Learning Technologies, Plymouth University, UK) and his student co-presenters, Becca Smallshaw and Kate Bartlett more in the hangout with them; we had a conversation with Jonathan Worth (Senior Research Associate, Newcastle University Open Lab, UK) which ended with an action-step to ask Cory Doctorow (journalist and science fiction author) to share ideas with us for ways to enhance literacy about privacy to kids under 10. We also had a pre-keynote discussion with Laura Czerniewicz (Director of the Centre for Innovation in Teaching and Learning (CILT), University of Cape Town (UCT) in South Africa) and Catherine Cronin (Educator & Researcher, National University of Ireland, Galway, Ireland) on inequality. The sessions are imperfect: sometimes conference wi-fi drops off, as it did during our session with Martin Weller (Professor of Educational Technology, Institute of Educational Technology, Open University, UK), but virtual participants usually continue discussions until onsite participants can return. Sometimes, virtual conversations continue after the onsite participants have signed off. While we are taking a small number of people away from the onsite conference for a short time, we are leveraging the powerful networks onsite and sharing some of the atmosphere and quality conversations with people online in a sort of guerilla ‘un-conference’, to hack a term Martin Weller used when we hung out with him. These are meetings that focus on connection, not content. Even though we do it anyway, networking of this sort is enhanced when conference organizers support the initiative by announcing what it is to people onsite (as the organizers of Digital Pedagogy Lab Institute did – playlist below). 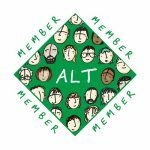 In this respect, #altc organizers retweeted our tweets, helped us find good wi-fi (thanks Martin Hawksey) and invited us to contribute a post to the ALT blog after the event. Chris Bull also helped by taking photos while we connected with Jonathan. At the upcoming conference #dlrn we have been given a dedicated space to use for sessions with a stable internet connection. We are also presenting about virtually connecting at #olc15 and #dlrn this October. 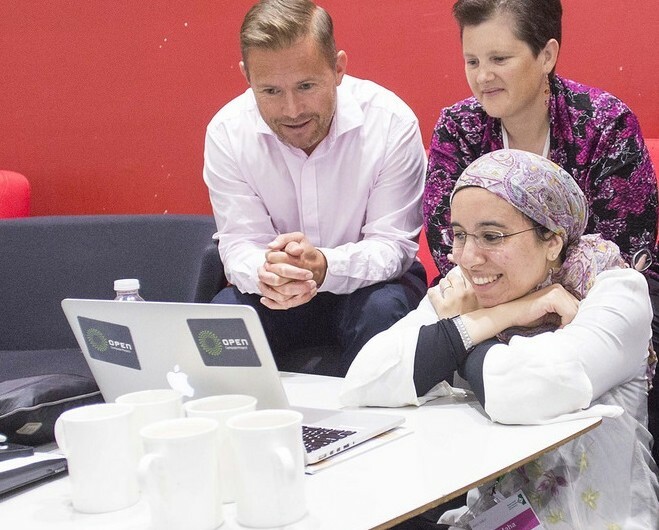 This conference marked the first time we (Maha and Rebecca) met in person, so we also had an informal hangout to share the joy of this meeting – and many of our virtual friends joined to see that. We also had a terrific team of virtual buddies from the US, France, UK and Australia who organized and ran everything – Autumm Caines, Simon Ensor, Suzan Koseoglu, Alan Levine and Wendy Taleo. It is a lot of work for one pair to lead multiple sessions at one conference. In future conferences, we hope to have different onsite and virtual buddies to reduce the amount of time it takes up for any one person. Martin Weller suggested we do virtually connecting at #opened15 and we now have a team of volunteers. We also have a team for the upcoming #dlrn conference and also #olc15. In another tangential expansion, we experimented with Virtually Connecting at the Queens University of Belfast ePatient conference, having important discussion about patient engagement and allowing those who could not attend onsite to have conversations about the conference themes. If you have a conference you would like Virtually Connect to converge with, or want to participate in one of our hangouts join us by completing this form. Photograph courtesy of Chris Bull. So you take the keynote away from anybody who might want to talk to them and go off to a recording with your elite group? How does that help other slightly shy delegates who might have approached the keynote otherwise? What a selfish, privileged group you are. I disagree keynotes and presenters are welcome to do as they like before and/or after their slots and of they want to participate in these sessions that’s up to them. 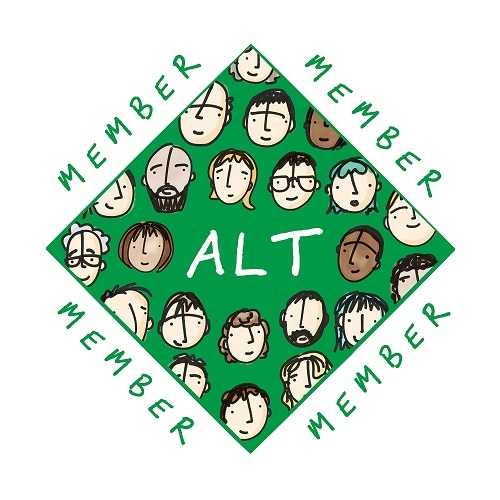 Personally I think it’s great that members of the community approached participants at the conference (not just keynotes) to be part of these sessions and the recordings capture the thoughts and reflections of those involved which would otherwise been lost (also not forgetting the opportunity to engage with the remote audience who’s voice often gets lost). I also saw all of the keynotes were at the conference for at least two of the days so it’s not like there wasn’t other opportunities for other people to speak to them.